These arrows sold only in Lots of 2. 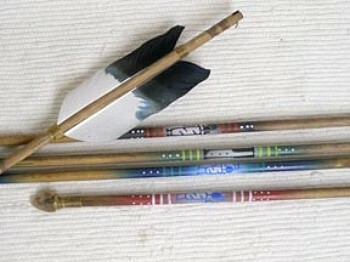 Price shown is for 2 arrows (1 lot). 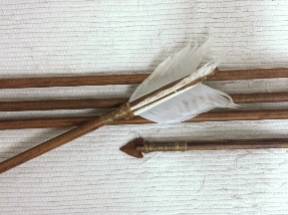 This is the RAWHIDE WRAPPED ARROW which measures 32″ in lenth made by Leo Holiday of the Navajo tribe. 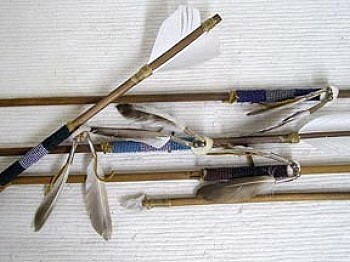 These are tipped with a carved bone arrow head & fletched with real feathers by hand. All wrappings & painting is done by hand. 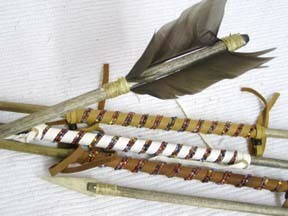 It features an area on the shaft that is wrapped by seed beads & each end is wrapped in hand sewn rawhide. 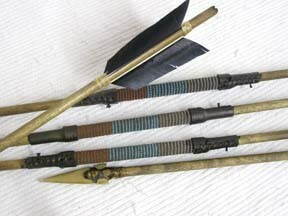 A very rugged looking arrow.